Now you can watch video/movie in just about any format on your iPod with ImTOO iPod Movie Converter. With this professional movie to iPod converter, you can convert almost all Standard/High-definition (SD/HD) video types including AVI, MPEG, WMV, DivX, MP4, H.264/AVC, MKV, AVCHD, RM, MOV, ASF, 3GP, VOB, AVCHD, H.264/MPEG-4 AVC, HD AVI, AVCHD, HD MPEG4, HD MOV, HD WMV to iPod MPEG-4 and MP4 video formats. With the ImTOO iPod Movie Converter, you can take your entire music with you. Convert MP3, WMA, WAV, M4A, AAC, APE, and CUE to iPod supported audio formats. To see how the movie to iPod converter can transform your iPod movie experience, try ImTOO iPod Movie Converter out now for FREE! Convert AVI, MPEG, WMV, DivX, MP4, H.264/AVC, MKV, AVCHD, RM, MOV, RMVB, ASF, 3GP, VOB to iPod MPEG-4 video. Convert popular audio format files such as MP3, WMA, WAV, M4A, AAC, APE, CUE to iPod MP3, M4A, WAV, AAC, AIFF. CD decoding is supported. Supports multi-core CPU – takes full advantage of your multi-core system when converting iPod videos/movies. Fully supports all iPod models: iPod touch, iPod nano (5th Gen), iPod shuffle and iPod classic. Provides you with the option to transfer the outputted files to iPod/iTunes directly after conversion. Adopt NVIDIA CUDA & AMD APP encoding technology to increase iPod movie conversion speed up to 5x. Convert multiple files simultaneously with support for multithreading and batch conversion. Convert a section from a video or audio file; split a large file into several so you can fit it onto your iPod. Set output parameters including bit rate, frame rate, sample rate, audio channel, resolution quality and codec. Get the precise output file size by using the Bitrate Calculator. Convert a source file into multiple iPod video formats simultaneously. Set the application so it will auto exit, shut down, hibernate, or stand by after a task is complete. Take snapshots of movie images and save them as JPG, PNG, GIF, and BMP image formats during preview . Preview the video files with the built-in resizable player (4:3 and 16:9 zoom modes) . 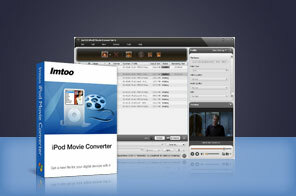 ImTOO iPod Movie Converter offers the function of power management. Tutorial : How to convert video to iPod with ImTOO iPod Movie converter? How to convert iPod video/movie with ImTOO iPod Movie converter? Perfect iPod transfer and backup software to copy iPod songs, movies to computer, iTunes, and your other iPods. Convert DVDs to iPod MP4, MP3, M4A, AAC, and other video and audio files. YouTube video downloader and converter for Apple iPod: download and convert YouTube (.flv) video to iPod MP4 video. Convert Blu-ray movies to popular video and audio formats. How to convert songs from iPod to Mac? How to sync iPod songs to computer? How to copy playlist from iPod to iTunes? How to convert WMV to iPod Video? How to transfer video from iPhone to PC?